The Council of Australian Postgraduate Associations (CAPA) is again calling on across the board income support for postgraduate students that was recommended as part of the Bradley Review. Recent research into student completions as well as the deteriorating mental health of postgraduate students should be ringing alarm bells within the higher education sector and the upcoming budget is the perfect time to act. Research into the deteriorating mental health among PhD students has also shown that stress levels facing postgraduate students has them at breaking point. While the complexities of this mental health crisis requires a massive cultural change in research training, some of the stress factors such as finances can be addressed for many students through basic income support. CAPA has called for expanded income support in every budget since the plan was cancelled in the 2014 Mid-year Economic and Fiscal Outlook and will continue to do so until adequate support is given. The Council of Australian Postgraduate Associations (CAPA) is disappointed with the lack of vision presented in the Federal Government’s National Science Statement. While the statement continues the tradition of platitudes towards science and research they have again missed the opportunity to make Australia the world leader the research and innovation. By its own admission Australian universities are home to 45,000 postgraduate FTE postgraduate students with over 10,000 students completing research degrees in 2015. This is a large percentage of the Australian research workforce that provides over half of the human resource hours within universities but the idea of adequately funding research training seems to escape the Federal Government yet again. Research training itself seems to be lacking completely in the Federal Government’s Science Statement except for a single throwaway line about “research training and leadership in science of high quality”. Out of the “Principles for government science policies and activities” there is not a single mention of research training being a guiding principle for the government. In the Science Statement it is mentioned that research training equips graduates with the abilities that are fundamental to the knowledge economy and essential for innovation, an idea that CAPA has always held as the real benefits to research training. “It is mind boggling that the Federal Government can trumpet the innovation agenda but at no point ever consider adequately funding research training which has been cut repeatedly in the past.” Said CAPA National President Mr Peter Derbyshire. “Ever since the Federal Government started touting the innovation agenda we have hoped that it would be accompanied with adequate research training funding but alas we are disappointed yet again. It will just mean a continuation of cash-strapped students having to fund their own research out of their pocket.” Said Mr Derbyshire. CAPA again calls for an increase to research training funding in universities to train the innovators needed in the future and put their funding where their rhetoric is. 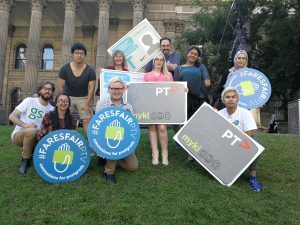 Today the Council of Australian Postgraduate Associations (CAPA) will be attending Speak Out for Fares Fair PTV at the state library at 10:00am EDST. This is an event to hear the Victorian voice of postgraduate students who do not have access to concession Mykis for full time international students and for full time domestic students. Since early 2014 CAPA has been passionate to advocate for postgraduate concession Myki cards in Victoria. Victoria is the only state within Australia that does not have access to this basic need for postgraduate students. In 2015, we were proud to work with the Graduate Student Association (GSA) on establishing the FaresFair Coalition. A group of postgraduate representatives were invited to join the coalition and to establish a cross university platform to advocate for student travel concessions to extend to postgraduate students. Postgraduate students in Victoria pay the most when it comes to public transport costs in Australia, coupled with fact that around 50% of full-time domestic graduate students have incomes below the poverty line. One in seven has an income below $10,000 and one in five full-time international students are on very low incomes which makes it almost impossible to balance work, university and external commitments. The speak out is aimed at showing the state government and the general public that while postgraduate students have suffered the ongoing outrageous costs of public transport long enough. We are a united voice and we will continuously push, advocate and lobby governments until the day we have postgraduate transport concession cards for all full-time domestic and international students. Throughout the year we will be encouraging postgraduate students around Victoria to get involved with the FaresFairPTV campaign. We plane to build our movement so that our voice is heard across the state and even the nation. CAPA is a proud supporter of this campaign and we acknowledge the work done by the GSA and all of our universities in Victoria who have all been passionate about this campaign and its implementation. 1. The extent to which students are graduating with the skills needed for the jobs of today and of the future. 2. Matters relating to laws and regulations that may act as a barrier to education providers being able to offer qualifications that meet the needs of the new economy and fastest growing sectors. 4. Relationships between tertiary education entrepreneurship programs and public, private, and not-for-profit incubators and accelerators. The provision of scholarships to postgraduate students is one of CAPA’s ongoing concerns as there is often confusion in regards to the taxation status of scholarships and the working relationships that sometimes exist between scholarship provider and scholarship holder. Tools such as “is my scholarship taxable” are essential for students however it is not something that is widely known about by scholarship holders. A review of the advice provided to ensure simplicity, clarity and accessibility of information is a useful initiative. 08 March 2017- International Women’s Day is a day that celebrates the social, economic, cultural and political achievements of women global. This year’s theme is #BeBoldForChange. International Women’s Day is also a call to accelerate gender equality, with a more gender inclusive world, a world that goes beyond mere words for change but taking ground-breaking actions that truly drives the greatest change for women’. 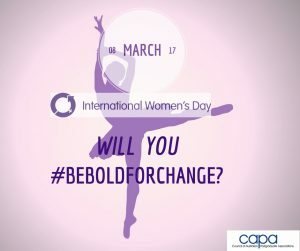 This year, The Council of Australia Postgraduate Associations (CAPA) supports the campaign to #BeBoldForChange, in the area of violence against women, one of the many categories that people can #BeBoldForChange. We will educate young women about positive relationships, challenge those who justify perpetrators and blame victims, speak out against the silence of violence, campaign for the prevention of violence and abstain from all violence, physical and otherwise and stress the need for mandatory sexual consent awareness and training on our university campuses. ‘When students who are victims of sexual assault on campuses are silenced or perpetrators actions not reprimanded, we tend to assume that gives a go ahead for continuity’. ‘Women should be bold enough to report cases of abuse without fear of being suppressed, ignored or dismissed. We will continue to advocate for the safety of women on and around our campuses until universities take up measures that encourage unbiased reporting mechanisms and provide support services for women’. As today is marked Internationally, women should feel safe in the community they consider as an institution for learning to develop the potential they need to succeed.